Making the Best Breed Better, One Litter at a Time. 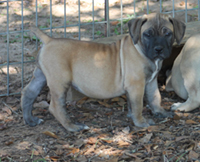 From the moment I first laid eyes on a Boerboel, I knew I had to own one, and as they say, “The rest is history.” My wife and I acquired our first female Boerboel, Kadeya, in the first part of 2009, and then our first male, Adolf, sometime thereafter. 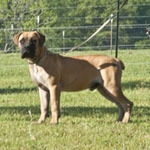 Adolf was purchased after many days of searching for a top male Boerboel, the right one that would fit our future plans. We located Adolf in South Africa and purchased him at 18 months of age. 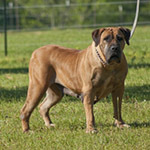 With Kadeya and Adolf, the right combination and caliber of foundation Boerboels was in place and Hidden Creek Boerboels was born. On our farm in Dothan, Alabama, we have been privileged to produce many outstanding animals with the prefix Hidden Creek in their name. 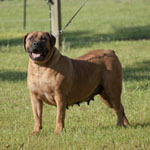 Carrying that tradition over into the world of Boerboels, the Hidden Creek name can now become synonymous with top-quality South African Boerboels. 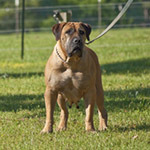 We have a rich past but an even brighter future, and we truly look forward to what the future holds for us and our Boerboels here at Hidden Creek. 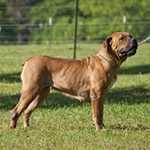 All of our dogs are registered either with the South African Boerboel Breeders Society (SABBS) or the North American Boerboel Breeders Association (NABBA). SABBS is based in South Africa, while NABBA is based here in the United States. 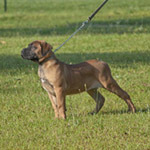 Each of these organizations have the highest standards for the breed. 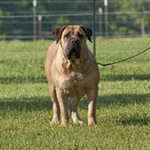 Each and every one of our Boerboel dogs are appraised by one or both of these organizations. Info: Mayhem is our big, gorgeous boy. Everybody who sees Mayhem loves him. He has a way of getting in your eye, meaning you can't help but notice him. He loves to entertain the guests who visit the kennel with his patented move from the upright position on his kennel panel. It can't be described, it must be seen. If you come and visit, he is certain to show it off. Pinnacle Havock is the #3 ranked male in the world with an appraisal score of 96.1%. Info: Nata Boeta is our up and coming young male, who can best be described as a presence. He is what I call the total package—personable, powerful, correct, well-bred, and beautiful. He has a special place in our hearts and in our kennel. 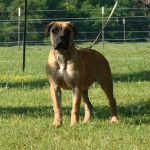 He is the future of Hidden Creek Boerboels, and you will be hearing a lot about him and his progeny as we go forward. Middelpos Alpha is the #2 ranked male in the world with an amazing 97.9% appraisal score. Info: Kadeya is a sweetheart. 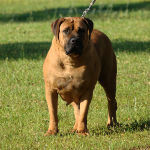 She is a very loving and very smart Boerboel. Her nature and her eye appeal is such that she demands your attention. To quote a local businessman who purchased three of her puppies, all out of the same litter, "That is a show nuff dog there. 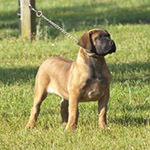 That is what a dog ought to look like.” Her puppies are very much in demand. Unfortunately, due to her age, we will only be breeding her one more time. Kadeya received a very, very good appraisal score of 92.3%. Info: Angelina is a very laidback, easygoing gal. She has a great nature about her. She never causes a second of trouble. As a matter of fact, most of the time, if you didn't know she was around, you wouldn't know she was around. 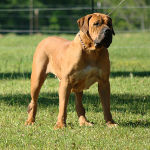 She is loving and loyal, as all of our Boerboels are, but she very much minds her own business. Her nature compels you to love her. 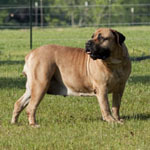 Mighty Donto was produced by Mighty Boerboels in South Africa, the kennel that produced Mighty Dukkahri, the #4 ranked male in the world with an awesome 96% appraisal score. 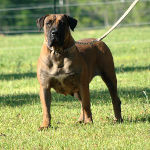 Info: Bailee has everything you would look for and want in a Boerboel female. She is our fertile myrtle. She holds the record of producing the largest litter—19 puppies—ever delivered at Auburn University. 19 ties the record for the largest litter ever produced in the USA. She knows how to get the job done. She is a large, well-built girl with a very desirable, welcoming nature. 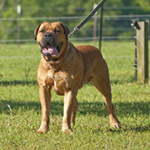 Mighty Mason Storm was produced by Mighty Boerboels in South Africa, the kennel that produced Mighty Dukkahri, the #4 ranked male in the world with an awesome 96% appraisal score. Weight: 55 - 60 lbs. Info: Kachata is so much like her mother, Kadeya, it is amazing. We might should have named her Kadeya II. She has Kadeya's personality to a T. She is young, but she already displays those much sought after and desirable traits. Her present size suggests that she is going to be a larger female than Kadeya. She has tremendous bones, a beautiful black mask, and dark color. There is no doubt her progeny, just as her mother's before her, will be much in demand. 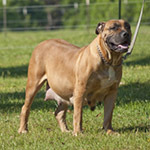 Info: KT is the largest of our females, and she is a big baby. She is our gentle giant. She is such a joy to have around. Her personality is just that, her personality. It is uniquely hers. 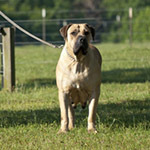 We really do not have another Boerboel who is natured just like KT. If there is a body of water around, she is going to get in it; she loves the water. 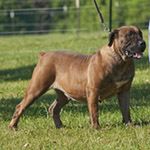 Targus Pocket Money was the 2009 Grand Champion male of South Africa, and he was awarded an impressive 93.8% appraisal score. Info: LJ is not our tallest female, but what she lacks in height she makes up for in muscle and structure. She isn't short, but she isn't tall. However, it isn't her height that people comment on, it is her overall completeness that tends to get their attention. 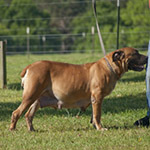 She is built like an athlete, and she passes that on to her offspring. To top it all off, she is a joy to have around. Middelpos Azaan was the #5 ranked male in North America in 2011, and he was awarded a 93.8% appraisal score. Info: Sarena has such an exuberant personality, she will not let you ignore her. She is absolutely full of life and always has been. She has an unbelievable memory, and she is exceptionally intelligent. Adolf I was the #6 ranked male in North America in 2011 with an appraisal score of 93.3%. Info: Sophia, as Sarena's litter mate sister, has some of the same wonderful traits, as well as her mother's impressive chest. As long as you are showing her attention, everything is A-OK in her world. 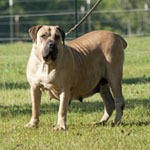 She is very loving, as are all of Kadeya's offspring, and carries herself with a noticeable confidence.